Over the next few days, the Philadelphia 76ers will begin to understand what the Boston Red Sox have been going through for three years with Manny Ramirez. How do you trade your best player knowing that it’s going to be impossible to get face value back? ESPN reports the Sixers are going to make good on Allen Iverson’s trade request after sending its star home Friday night and ruling him out for at least the next two games. All the annalists at the worldwide leader are saying he’s as good as gone, though their baseball people did the same with Manny last week. It’s just not that easy. I understand the need to rebuild, but unless the team comes right out and tells the fans they’ve decided to tank the season and pray for Greg Oden, I don’t see how anyone is going to handle trading 31 points per game away for Randy Foye and Ricky Davis, as one article mentioned. By the way, the Celtics tanked a season once in hopes of getting Tim Duncan. They wound up with Chauncey Billups for half of a season. 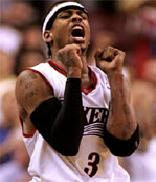 Maybe it just because I’ve lived through the Manny-era, but my gut tells me Iverson is going to stay in Philly for awhile, maybe even the rest of the season. Whether they’ll play him or not is a whole other question. Arenas at 24, or AI at 24? - Though this doesn’t have much to do with AI being traded, Bullets Fever poses a great question.